This homemade face wash is a natural DIY face wash that works great, is inexpensive, and easy to make. You can also tailor it to your specific skin type. Now that I have more knowledge about the ingredients used by multinational corporations, I’m more selective about the personal care products I use, and usually, prefer to make my own. Want to know about some of the ingredients that may be lurking in your innocent little bottle of store-bought face wash? How does DMDM hydantoin, a formaldehyde-releasing ingredient, sound? Or maybe you want synthetic colorants in your face wash? Like the D&C or FD&C varieties that are continuously tested on animals due to their carcinogenic properties. No? Well, maybe you’ll want a synthetic fragrance in your facial wash, which has been linked to allergies, dermatitis, respiratory problems, or possible effects on the reproductive system. I’m no longer convinced that even the expensive natural products contain magical ingredients to solve all of my skin problems (or friendship problems). Some of them appeared to be the consistency of castile soap, very runny and yellow-tinted. And what do you know, the first ingredient in most of them was castile soap, followed by ingredients such as aloe vera gel, essential oils, Vitamin E, vegetable glycerin, etc. Not such an intimidating list of ingredients. 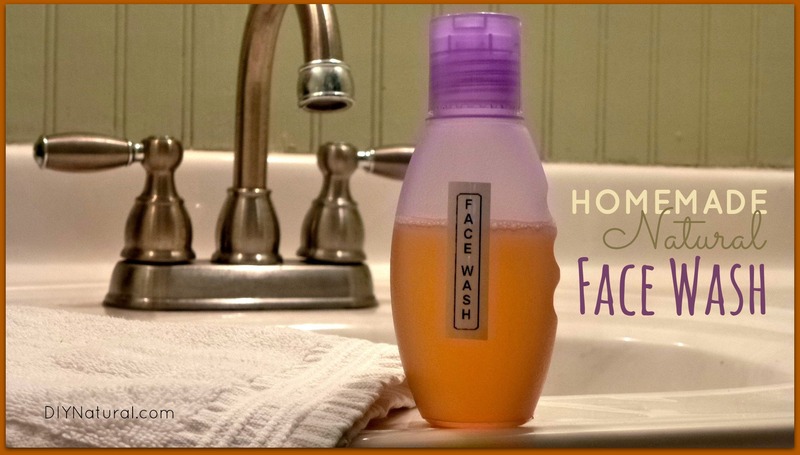 You can make your own DIY face wash! Even though I keep all the aforementioned items on hand in my house these days, I decided to I keep it very simple and mixed up the following recipe for my combination skin. The chamomile tea and other simple, gentle ingredients make it perfect for sensitive skin, but this DIY face wash can be tailored to meet the needs of your exact skin type – I’ll show you how in a bit. Combine remaining ingredients in a small bowl and add tea when completely cooled. Mix ingredients well and pour into a small squirt bottle or pump bottle. Be sure to label your container. This recipe makes about 4 ounces of homemade face wash.
Squirt DIY face wash into hands or washcloth and gently wash face. Rinse well. Follow with your typical toner and/or moisturizing routine. Castile soap can be purchased online or at most health food stores but is also becoming widely available at chains like Target, Kroger, or WalMart. I prefer to purchase mine at local health food stores where I can bring my own container and refill for about half the price of purchasing a brand new bottle. My skin loves this DIY face wash, and I hope you’ll give it a shot if you’ve been looking for a good natural alternative! Note: Find more homemade beauty recipes here. Now this is what I call fine material. This lets you know that there are still good subject material publishers on the web. Thanks for this recipe. I usually just use my facial oil to clean my face, but sometimes wish I had a regular facial wash, and this is it!!! I have only just noticed the number 54 at the top, it is not very visible, maybe they should have written it using miniature orangesnow jackets or even just send up a flare. 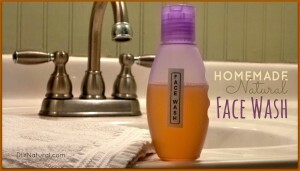 It has been over a year since using this face wash recipe. I use the chamomile tea, castile soap, 3/4 tsp hemp seed oil and a little rose hip oil. When I first saw this post I thought it was crazy to wash your face with a recipe that had oils in it. But I tried it and it made a huge difference right away. I struggle with hormonal cystic acne. Along with balancing my hormones with diet and exercise, I’ve noticed a huge difference using this face wash. When I have been traveling or unexpectedly don’t have my diy face wash with me and use store bought versions, it dries out my skin, kicks up my oil production, and causes new breakouts/clogs in my pores. Even store bought moisturizers that I thought were labeled non-comedogenic, react to my skin. I’m not sure what ingredients in them cause this, but I’m so thankful for stumbling upon this website and recipe. Thank you so much for sharing!! If there is anyone out there reading these comments thinking of trying this recipe out, I highly suggest it! I chose oils and essential oils that had 0-1 comedogenic rating. For my acne prone skin, the hemp seed oil and argan oil has a 0 rating. Using them on my skin has never made me break out. Make sure to use quality ingredients and you have nothing to worry about. I am a migrainuer using the facial cleanser for IT Cosmetics for $38 a jar. It is the only “soap” that I have been able to clean my face with – I am anxious to round up the items and make your recipe! Onto my next problem. I live close to Las Vegas and have really dry skin on my body. I have NEVER been able to use a body moisturizer that won’t give me a migraine. Do you have any recipes for moisturizers? +Betsy Jabs, thanks! And thanks for sharing your great posts every week! Did I miss the toner recipe? No, I don’t actually have a toner recipe on the website yet. However, my favorite is to mix witch hazel with things that are good for the complexion, like pure aloe vera gel, a little lemon juice, rosewater, etc. Hope this helps! I have Castile bar soap available and didn’t want to go out for more, is there a way to use this in your recipe? I’m excited to try it but the only way I can get the liquid is to order online…I don’t want to wait! Sure Tami! You can grate a tablespoon of your bar soap, and cover it with 1/2 cup hot tea (or hot water). Stir it until the grated soap is melted, then allow it to set up overnight. It will thicken by morning, and if it’s too thick just add a little more water until it’s the thickness you like. Then you can add the remaining ingredients and mix well. Could jojoba oil be substituted for the grape seed oil? 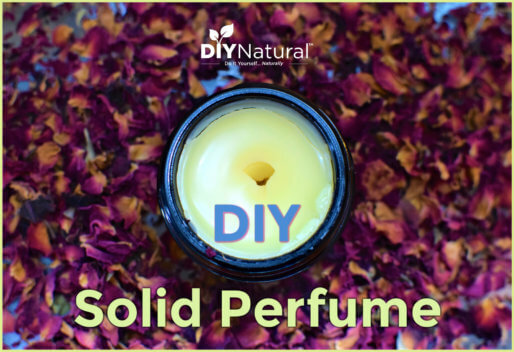 These natural home-made products are definitely better than the ones full of chemical. Thanks for sharing the face wash recipe. The whole thing sounds great. Thanks for this, Betsy! I was wondering if I could substitute the Castile soap for normal soap. I realise this will have an impact environmentally, but is there any reason other than that to use Castile rather than normal? I’m assuming you mean normal liquid soap? It really depends on what brand you use. Normal, run of the mill brands contain so many harsh chemicals that aren’t friendly to your face. This is the purpose of the castile soap…it’s very pure and gentle. However, if you use a good organic brand without toxins, it might work well. THANK YOU!!! This is the MOST AMAZING thing I’ve ever put on my face. I have combination / sensitive / oily / mid 30’s skin. I’ve been on the hunt for the perfect facial cleanser for years. I’ve finally found it and I could not be happier! After using it once, my face skin looked amazing. My son’s pre-teen acne is even looking better because of this cleanser. My friends and family all want to try it now because I can’t stop raving about it. Thank you again from the bottom of my heart! Thanks Betsy! I just started using this last week & am loving it. I’m also acne prone around TOM and not a spot on my face thus far. My husband even commented on how nice my skin looked. I’ve been using the recipe that Terri described as a shampoo for the last few months and it’s fantastic (castille, aloe vera gel, EOs, oils etc). It’s done a great job with my poor dry scalp. Someone also asked if you could moisturise with coconut oil. I’ve also been moisturising recently with coconut oil infused with EO. I was a bit concerned at first because I’d read it was pretty high on the comedogenic list (4 in fact) but I read Bruce Fife’s book and he says it’s good for your skin, but it can get worse before it gets better as it pulls impurities out, so I took a chance and tried it. The first couple of weeks the blackheads seemed to get bigger but softer, and now they are no better or worse than before. I can’t say at this point that it’s made any difference either way to my blemishes, but what ~has~ changed is the texture of my skin – softer with finer lines (I’m 48), plus it feels and smells gorgeous too! Thanks for chiming in on the coconut oil issue. I have heard of others using straight CO for facial moisturizer, but have always read about its high comedogenic rating. How long have you been using it? It’s probably been a couple of months now Betsy. It’s certainly no worse than the moisturiser I was using before, which was marketed as non-comedogenic. I use it on my face, neck, and the wrinkly bit at the top of my chest, and I can’t say for sure (because our summer’s been rubbish) but it does seem to have stopped me going pink in the sun since I’ve been using it too. I went cycling on one of our rare sunny days and the bits I used coconut oil on didn’t burn, but my lower back which was also exposed did. I do tend to burn very easily (red hair and fair skin) so I’ve been quite impressed. I’m not ready to give up the sun cream yet though! Yes, that’s awesome! Coconut oil has been estimated to have SPF levels between 4-10, so that’s the reason you didn’t get pink in those areas. i been using VCO as my cleanser for a month now. for me vco save my face. i have acne prone oily skin and now all pimple gone. i use it once a day only, on night time, before bed. it leaves my face smooth, and the dry feeling after cleansing with commercial cleanser also gone. save me a lot from buying ton of facial product. anothe thing the vco that i use is homemade by my mom. I tried using the oil cleansing method, and although it cleaned and left my skin feeling soft at night, my skin felt really oily the next morning. So, when I came across your skin cleanser recipe, I was ready to try it. I am happy to say that my skin feels nice and clean, not too oily and not too dry. I have found that I really do not need alot to get great lather. It’s perfect! Oh, I’m so happy Ruth! I have not tried the OCM, but I do love how this cleanser gives me a clean feeling and my skin is very soft, never dried out afterwards. Thanks for commenting and letting me know it’s working for you! I was starting to get eczema on my eye lids, I call it my alligator skin eyelids, it pops up seasonally then the asthma/allergies kick in. I have tried everything to make it go away and I had to go to the doctors for a prescription the last time it popped up. Well, I made the facial cleanser & I have been using it for 4 days now. The eczema started improving after the first day & now is completely gone! I have also been using the moisturizer recipe. My teen daughters asked me to make some up for them. I used unscented castile soap, grape seed oil & almond oil with distilled water. I might tweak the next batch or purchase scented soaps next time. The one question my girls & I had is…Sunscreen…any moisturizer recipes with sunscreen abilities? Natural homemade sunscreen besides a hat? Thanks!!! Question, it looks like the Bonner’s liquid Castile soaps already have extra virgin coconut, olive, jojoba and hemp oils in them, so is it necessary to add the 3/4 teaspoon grapeseed, sweet almond, hazelnut, avocado, or olive oil? Thanks!! Great question Vicki! It depends on your skin, but you may be able to get away with omitting the extra oil. Dr. Bronner’s alone is too drying to my face, so the little bit of added oil creates the perfect wash for me. Try it both ways and see what you think! Wow! That’s a huge victory to hear that the blemishes have subsided and you’ve experienced clear skin for a month now! Glad we could help as you transition to more homemade products. 🙂 Thanks for the bentonite clay mask recipe! $6 for a 1lb. jar is an awesome deal! I tried the bentonite clay & apple cider vinegar on my face…it left it quite red for a time. Thankfully I used it early enough in the morning that by the time I was ready to “face the public”, I was normal colored again lol. Might want to start with just water & clay, then move up to half water/half vinegar, then full strength vinegar. Just an idea. Hi- I find the castille soap to be too strong. Anything with ‘soap’ still really dries out my sensitive ‘approaching 40’ skin. I have been experimenting with washing with just oils and its been great and also quite inexpensive. is there a substitute for the castile soap? Like baby soap? I got some samples of that and need to find a way to use it up. never mind the question, my local health foods store had it! I live in the middle of no where that was another reason why I asked! Glad you found it Jenn! Thank you for all this great recipes!!! Glad you’re loving the book! Thanks for your purchase! You can definitely use this recipe as a hand soap…good thinking! You may want to add a little Vitamin E or rosemary essential oil (as a natural preservative) if you’re making a large batch that will sit by the sink for extended periods of time. I have all the ingredients, ( and I am so excited!!!!) 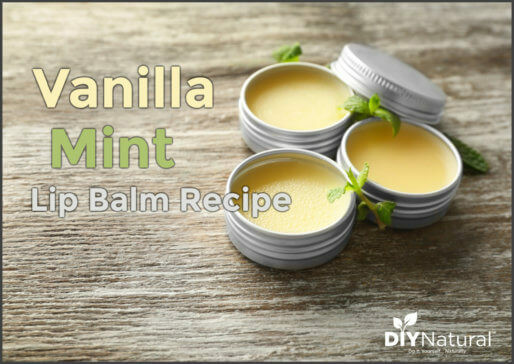 How many drops of either essential oil or vitamin e will work for this recipe? I made it and everybody loved it, it was a little too liquid, but i used a pump that creates foam, and it was perfect for that, I used to as body wash, let my skin a little dry, but very clean, love it, love it, love it!!! Yes, it’s a very runny formula, not gelled like commercial soaps. Glad you like it though. 🙂 I would use several drops of Vitamin E (or the contents of one capsule) or about 10-15 drops of rosemary essential oil for the proportions in this recipe. Love your site! Thanks for all your great tips and recipes. I recently started using baking soda shampoo (which works really well for me!) – by accident some of it slipped down my face as I was washing my hair, and I noticed how clean and oil-free my face felt after that. Since then I’ve started using the same shampoo mix to wash my face, and it feels great! Just wondering if you have ever done that and if you think that’s a good idea? I just hope I’m not drying out my face too much! It seems like all the best discoveries are accidental! 🙂 I do wash my face with a bit of baking soda and water about once or twice a week. I have heard of others using it more often (especially with oily skin), and your skin might do fine with this! Thanks! Its amazing how such a simple recipe can have so many uses. I’m thrilled to bits – travelling is going to be sooo much easier now! (I used to have to pack at least 10 different little jars and bottles for all my skincare needs.) And it pains me to think how much money I’ve wasted all these years… Well better late than never! Thanks again! I have made the facial cleanser twice and it’s quite runny. Any thoughts of what to use as a thickener? Also, what role does the tea play and why not use castile soap by itself? Yes, this is a very runny formula. You could use pure aloe vera gel to thicken if you wish. The chamomile tea has anti-inflammatory properties, helping soothe inflamed skin (great for acne), it’s great for dry skin, and can benefit an array of skin conditions (eczema, contact dermatitis,etc.). However, if you don’t have tricky skin feel free to omit. Awesome! Tea tree and lavender make a wonderful combination I think you’ll really enjoy as long as they’re agreeable with your skin. Have fun creating! I’ll give it a trial, I just hope it works for me because I have a hard skin. Keeping my fingers crossed your trial run works out! I’ve been using this face wash for a little over a week & I LOVE it! I follow it up by using grapeseed oil as a moisturizer during the day & jojoba oil at night. And I have extremely oily, acne prone skin! Not all oils are bad oils, I’ve learned that over the years. Thanks for all you guys do to help people live a more natural, simpler life! I’m glad you asked! I hadn’t done the math yet, but I just figured this recipe to cost about $0.88 for 4 oz. with the ingredients I used!!! That’s a HUGE savings compared to commercial facial cleansers! (My old Clean & Clear cleanser was about $4.25 for 6.5 oz.) This, of course, all depends on where you purchase ingredients and whether you can find deals. The castile soap is the most expensive thing, and I cut the cost in half by taking empty squirt bottles to the health food store and refilling with their bulk castile soap. Great question Sarah. Everyone’s skin is different, so I can’t say for sure how yours will react to this particular face wash. However, the purpose of the oils in the recipe are to allow your face to retain some moisture instead of stripping all the beneficial oils…which causes our skin to overcompensate by overproducing oils…leading to more problems. Essential oils are not the same as regular oils. In fact, many are antibacterial, anti-inflammatory, antiseptic, etc. Essential oils like lavender are good for any skin type. Hope this helps! Also..it’s not the oil that is causing your face to break out. The breakouts are caused by the dirt and debris that are trapped in your pores. Betsy is right about stripping the oils from your face. When you strip your natural moisturizers (oils) from your face with harsh or drying detergents your body goes into overdrive trying to replace them, thus causing the dreaded oil slick. Instead of olive oil you might try Grape Seed oil. The linoleic acid in grape seed oil has anti-inflammatory, anti-allergen, acne reductive, and moisture retentive properties. I use it in my homemade hand scrubs, body washes, bath bombs, and face wash. It is a very light oil and absorbs quickly. Hope this helps. This is a wonderful recipe, and so easy to make! Thank you for this! You recommend following up with my usual toner/moisturizer routine. Do you have a recipe for natural toner? I love how mine gets the last of my makeup off and tightens my skin, but it has all kinds of things in it that I can’t pronounce and even blue dye! Can you recommend an alternative? Witch hazel is a great natural toner. You can mix rose water or pure aloe vera gel with it for added benefits! Glad you like the cleanser! Has anyone else tried this and have an opinion? I have been making my own face wash for quite some time. I also use castile soap along with aloe vera gel and water, in equal parts. I have not tried this substitution to know what the result would be, but you can certainly give it a shot. Hello! Thanks for this. I’m always looking for new recipes to try. I was wondering, though, whether pre-scented castille soap is appropriate, or whether you need the original kind. I have both lavendar and peppermint castille soap at the moment, but I’m not sure how they would work for oily/combination skin. Any thoughts on how lavendar/peppermint would work for this skin type? The pre-scented castile soaps are fine for this recipe…I should have mentioned that in the article! Lavender is a great choice for oily skin, and peppermint is good for acne-prone skin. Haven;t tried the face cleaner yet, but I am impressed with the things I have tried. I will make the face cleaner as soon as I get my castile soap. I was wondering, if you have a remedy for something that will cover bruising. My sister, has very thin skin and it seems like if you just look at her, she bruises. It is uncomfortable for her as well as being embarrassed, with all the bruises she has. Thank you very much for any information that you might have on this. Sorry Nelda, nothing for covering bruises yet. 🙁 That sounds awful for your sister! Have you tried Arnica gel? It helps heal bruises. It’s no secret skin is the largest organ we have so putting anything on our skin means we ingest it. I’ve often wondered about lotions, sun screens, etc. and cancer. As I’ve aged, I’ve gotten away from using so many lotions, creams and sunscreen. I use hand made soap for everything…body, face hands. It’s pure, simple and re-hydrates my skin. The best tip I’ve got for re-hydrating my skin…when I get out of the shower, I don’t dry off but put on a 100% cotton terry cloth robe. I’ll wear it for 30 minutes and when I take it off, my skin is refreshed and re-hydrated. Thank you so much for this article. I have 4 teenagers and am always looking for safe products for them as well as myself. Can’t wait to give this one a try. Thank you for all the work you do to gather information and put together recipes to share. You’re so very welcome Becky! I hope everyone in the house loves this one! Great article! I’ll definitely try this when I run out of my current face wash.
Folks may want to avoid bergamot though, it’s phototoxic and can make your skin more sensitive to UV rays. It might not be a big deal in the small amount that’s in the face wash, but better safe than sorry I suppose. Good point about the bergamot Janny. I wonder though since it’s getting washed off instead of being applied in a product that will remain on the skin (like a lotion)…hmmm. I’ll have to look into this. I actually use bergamot in mine, and haven’t noticed any sensitivity to sun, however, this doesn’t mean it won’t make someone else’s skin sensitive to rays. Thanks for bringing this up! This is awesome! I’m going to be trying this out, that’s for sure! Just read the last part of the article and the facebook comments about the green tea.. so disregard the above question. 🙂 Guess I should have done it before I asked..hehehe. No worries Tobi…green tea is also a good replacement for the chamomile tea. Packed with antioxidants that are good for skin! I was wondering if I could use a different type of herbal tea since I am allergic to chamomile? Any ideas? I’m thinking green tea would probably work nicely 🙂 I don’t think it matters much though. Different ingredients just have different effects on your skin, so I would look up what benefits different herbs have on your skin. Hey what about grapeseed extract as a preservative? Do you mean grapefruit seed extract? Yes! That would work too! yes that’s what I meant sorry lol. I just ran out of my facial cleanser and was about to add it to the grocery list. I have all these items already. I just need to get a container for it. I love it when I have good timing! 😉 Look around your house for a container you can repurpose…I bet you’ll find something so you can get started making a batch right away! I use a foaming hand soap dispenser. It works great and feels luxurious. This is one of my favorite pieces that you have written. The reference to the girls in the commercials is just too funny. I always read emails from you guys!! Thank you for your hard work and sacrifice in doing what you do! It does not go unnoticed and I really appreciate it. Can you use coconut oil as a substitute to the grapeseed, sweet almond, hazelnut, avocado, or olive oil? Coconut oil will solidify under 74 degrees so it is not a good chioce for something that is liquid. 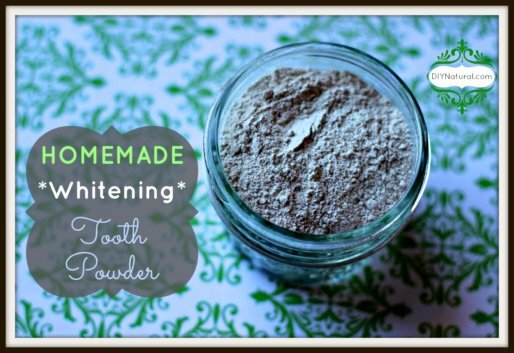 It’s great for making all natural skin creams. You can use fractionated coconut oil, it doesn’t solidify at room temperature. Thanks Betsy! I love your tips and recipes 🙂 I was just curious how long this mixture would stay “good” for— weeks? A month? Thanks for asking! I need to add this to the article. It should be good for at least a few weeks. Make it in the recommended small batch and refrigerate if you want to extend the shelf life. Thanks for this! I too am creeped out by the ingredients in my facial products, and I don’t like animal testing. Also thanks for giving substitute ingredients – I have strong ragweed allergies and can’t use chamomile. I’m 43 and still dealing with zits, thanks to my hormones and oily skin, so I’m always looking for something good for my skin that doesn’t make me break out. Ugh! I know, I have more breakouts now than I ever did as a teenager! Disappointing. Hope this works out for you! Robin- I have had great luck with my teenage daughter’s oily skin by having her take B-5. It is supposed to be a great oil controller. Also, I had a foster child living with me who had such terrible acne when he came to my house. He had been on everything -including Accutane! Within weeks of eating real food and taking B-5, his skin was like a baby’s behind! I’m in my late 50’s and still have skin problems. I checked out my B12 level and it was hitting the floor. Since I started getting the shots things have improved but I was also looking for this sort of recipe. I add Vit D3 in high doses too, I buy tablets/oil which are 5,000 units per day. After watching the videos by Prof Holick of Boston University I realised I was on the same amount daily as the baby gorilla whose life he saved!